The commission for this design came from American clients to live aboard on Chesapeake Bay with open water cruising to follow. My brief was for a design with shoal draft, poop deck and staysail schooner rig, suitable for the chesapeake with it's shallow areas as well as occasional coastal cruises in the gulf stream areas. The material chosen was radiused chine steel, similar in concept to other designs which I have previously drawn for the yard which is building the boat. The underbody is my idea of what a multi-chine should be, with horizontal central panel and a sharply angled first chine in the bow to minimise pounding, flowing into very flat chine angles aft to minimise drag and give powerful stern sections. Only the topside chine is radiused, to a constant radius of 1m. The main keel is long and shallow, housing all ballast, most of the tankage and the propeller and shaft. The hydraulically operated swing keel stows inside a casing in the main keel and projecting partially into the accommodation. It tucks in under the engine and is fairly inconspicuous. Due to the control problems of a broad sterned boat with shallow rudder, she has twin rudders, well spread and angled outward. This allows permanent rudders with no lifting arrangements being necessary while giving good control under all conditions. Instead of the rudder being heeled out of the water, the leeward rudder becomes more effective due to greater depth and being more vertical. The rudders also act as legs to keep the boat upright when aground. My eye finds most poop deck boats to be unattractive so it was a challenge to draw a boat of that concept with which I would be happy. The resulting deck has a raised centre cockpit, low trunk cabin and bulwarks all round except to the poop deck. The stern has a boarding/swim platform aft of a vertical transom. The interior is laid out for two permanently living aboard with occassional guests. Forward is the owner's cabin (where they wanted it) with it's own access to the large head with separate shower. Amidships to starboard are the nav station and a conversation area with the guest cabin to port and a small workshop. Under the poop deck are the saloon with dinette for six, two swivel easy chairs, large galley, head compartment and two quarter berths. The staysail schooner rig gives an easily managed sail plan (especially if roller reefing gear is fitted) with no working sail larger than 27,5 sq.m. 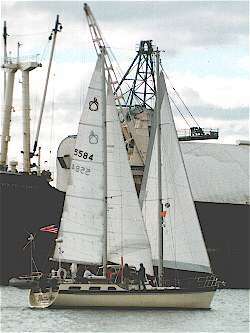 The main staysail is fitted with a camber spar to minimise flogging sheets over the cockpit and the foresail uses a half wishbone to contol the head, the half wishbone being hoisted along with the sail. For those who do not require a shoal draft or who prefer a single stick, fin keel and cutter rig options have been added. The twin rudder configuration has been retained even with the deeper draft. The keel and rig options are interchangeable to suit the owners' requirements. Follow theselinks to a material list for the structure, a stability curve and a list of drawings for this design.